This blog owned by and created by me Gloria Poole, R.N. also known as Gloria in script on paintings I paint; and on web as gloriapoole and other variations of my real name of Gloria Poole. 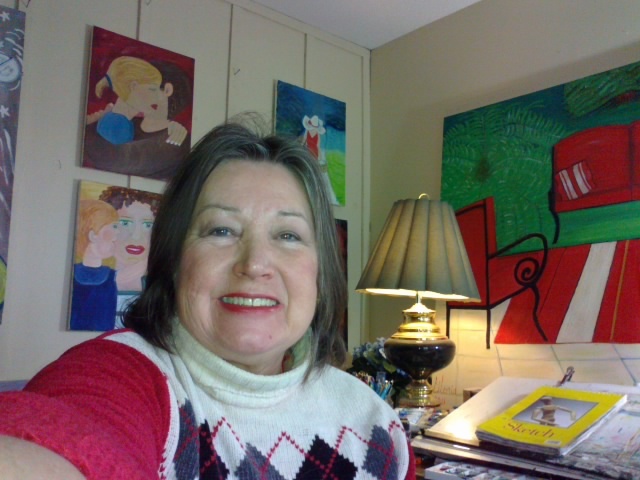 I am a Registered Nurse licensed in Missouri and an artist in oils,acrylics, watercolors, powdered pastels, goauche, tempera, inks, encaustic,pastels, chalk. I tried updating my tweets at http://twitter.com/gloriapoole/ but they blocked it. They really hate prolifers and Christians and especially most of all Republicans! So read my tweets on it that they are trying to prevent being added too today. South Carolina, Texas, Michigan, Nebraska, Utah, Pennsylvania, Alabama, South Dakota,Louisiana, Idaho, Washington, Colorado, and I think I forgot to write one of them down. I was reading from Reuters news articles however so you could look them up. Also Senators Graham of SC, Bennett of Utah, Bond of Missouri, Chambliss of GA, Crapo of Idaho, and many more introduced legislation to repeal the bad killing bill of Obama-Pelosi falsely labeled health care reform. My computer was attacked by the Pentagon I think since it has behaved in bizarre ways all day and I have had to reboot it constantly to prevent criminal hackers from intruding into it. Communist Obama snd his band of thugs at work again no doubt. Christmas Eve that was filled with backroom deals such as the Cornhusker Kickback. The Senate bill also still contains half a trillion dollars in Medicare cuts, half a trillion dollars in tax increases, job-killing penalties for employers, provisions that will cause premiums to spike, and radical provisions to fund abortion and ration health care. if I understand British law are born to that position] are debating how to balance the rights of consumers who use internet and expect it to be free, and 'creative' persons who create new material and copyright it and want any revenues from it.Includes notifications that an isp is violating copyright and may be disallowed from internet, as sent by isps from America. And Wall street article about the polling of the democrats revealing that nobody wants to vote for the Senate version of what is euphemistically called 'health care reform" but planning to go ahead and bypass the House of Representatives! Well that is reason to impeach all of them.The way that Pelosi plans to do that is a sneak trick bill that includes more than one bill but hiding the bad bill with another bill and calling for a vote.To piggy-back the bill that everyone opposes onto another bill to prevent a direct vote on it. The con-men and con-women there, oops Legislators, are trying to prevent the public from knowing how they vote. Keeping their million dollars of perqs jobs is all they are trying to do and to h___ with America is their attitude. The nation should impeach them all and shut down that wicked Congress! And the Tea Party in NJ has received a Judge's approval to start the recall procedure of a federal lawmaker.That is history in the making. I am posting these comments on events that are happening today. These are very relevant to the situation in America in every way. Because piracy on the internet is probably what siphoned off the trillions from US banks when banks had to reimburse their customers for money stolen from their accounts by internet pirates. And of course derailing the health care bulldozer is crucial to preventing a total rewrite of the U S Constitution by Pelosi and Obama by themselves. 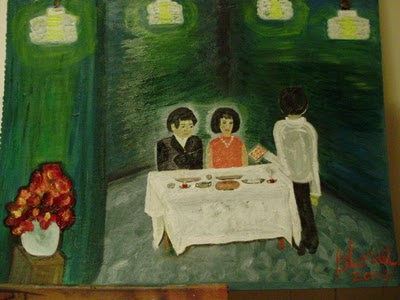 This is my photo of my oil painting I finished this evening and named "Hong Kong Dining" . It is oils paints on fiberboard. Didn't measure size of it but is rectangular. I hope you like it. Also I adjusted the links to remove links to domains and websites that were stolen from my by criminals; in order not to give space to thieves! 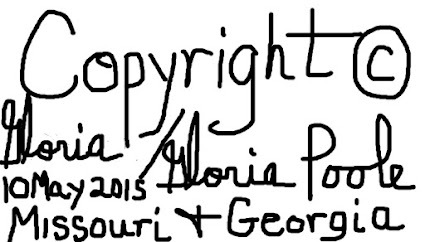 This blog is owned by and created by me Gloria Poole also known as Ms Gloria Poole, RN artist of Missouri who was born in state of Georgia in U S. and am U S citizen. I began this blog in the state of Colorado when I lived there for a few years, and continued when I moved to Missouri on Oct 31, 2009. See my about me page on top tab for more info and photos of me Gloria. I am Gloria Poole, also known as Gloria on art and on web as gloriapoole, g-l-o-r-i-a; gpoole817; gloria0817; gloria_poole; gloriapooleRN at yahoo, "Gloria Poole,RN"gloria.poole;gloriapoole.RN,gloriapoole [RN], gloria-poole;gloriapoole1749; Ms Gloria Poole; Poole,Gloria;gloria_poole; Gloria J Poole; and other variations of my real, born with, legal name of Gloria Poole. I am Christian,woman,white,single,heterosexual,mother of 2 grown daughters who are Jennifer and Leigh; divorced twice. I was born in Georgia. This blog and all content on it belongs to Gloria Poole of Missouri and Georgia and is copyrighted.. Simple theme. Powered by Blogger.